As smartphone cameras are getting better each year, you are able to do much more with it than taking photos. Earlier we talked about the best animation and stop-motion apps for Android. And as you can guess from the title, today, we’ll take a look at some of the best apps to do time lapse on your Android. This is the most stripped down version available in the Play Store. 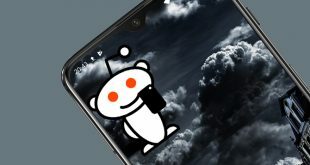 The app made the list because it is free, there are no ads, and is really easy to use. You can set duration and the recording will stop automatically. You can reset the fps after you have shot the video and the app will render a new video. This is what I did to improve the quality of the video I shot. Though it is free and easy to use, it is not without issues. During the tests, I found that the resolution of the time-lapse video was not up to mark. There is no way to use the front camera as well. Verdict: The app is free and comes without any ads which are good for people who are looking for free alternatives with no in-app purchases and minimal bells and whistles. The app name will show as Time Spirit when you download it. Not sure why some developers change the name, makes it confusing really. That said, when you open the app, there are two primary options to choose from. One is photo lapse and the other is video lapse. In the former, you can take photos, every day or whenever you feel there is some progress, up to a max of 30, and the app will create a photo lapse out of it. It is good for gym stories where you can show your transformation over a period of time. The video lapse option works better when you want to shoot something then and there. The developers call it video lapse so that users can differentiate between the two. It’s cool by me. You can add audio files like music in both the format, choose a max resolution of 1920×1080, and choose a duration between 1 minute to 12 hours. There is a start time which will come in handy if you want to be in the video, and you can set frame intervals. There are a number of filters to choose from. You can shoot using both the front and back camera. I wish the app worked in the background though. You will have to keep the app open when shooting. Also, you cannot turn your screen off. The timer is only available in video lapse which I don’t understand. The screen dims when you begin recording. I think this is done to save battery since recording can take a lot of time, but sadly, there is no way to control it. Verdict: The app is completely free and there are no ads which are really cool because it comes with quite a bunch of useful features that you will find useful. 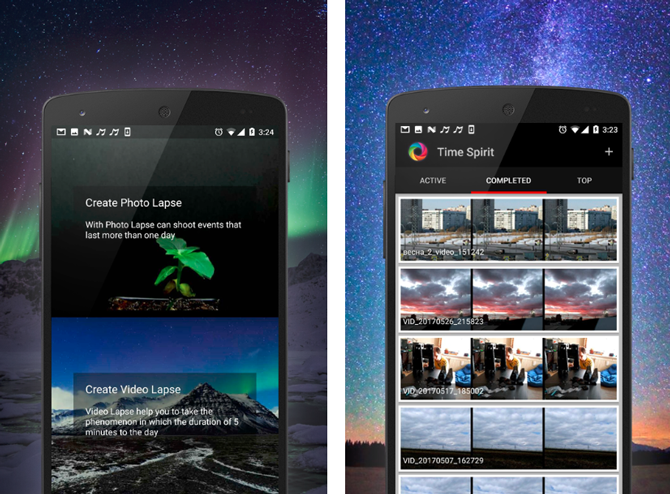 Lapse It is probably one of the most famous time-lapse camera apps in the Play Store. It is one of the few apps that are capable of doing time lapse and stop motion videos and is actually good at it. You can use existing images or videos to make a time lapse of the same which is something I liked. 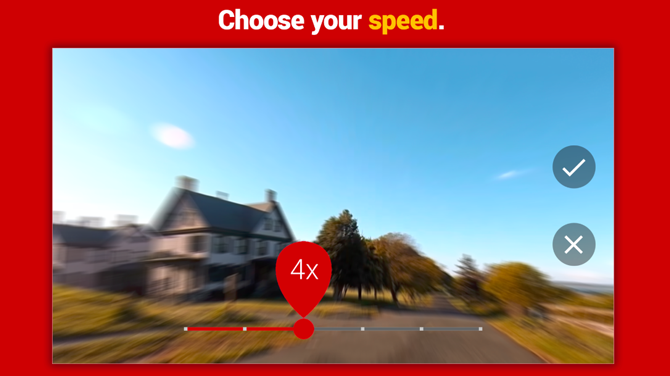 It offers more control over the speed of the video. Some features that previous apps were missing but should have been there like focus, exposure, modes, and white balance are there. The pro version, at $2.99, will add the ability to shot HD videos, add music, remove ads, add filters, and allow you to stop and resume capturing at different times and locations. 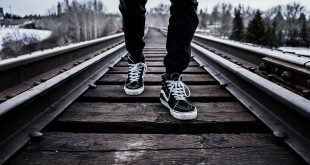 Apart from this, there are a lot of cool options like timestamp, trimming and editing, playing the video backward with the ability to export them in different formats. There is no restriction on the length of the video. 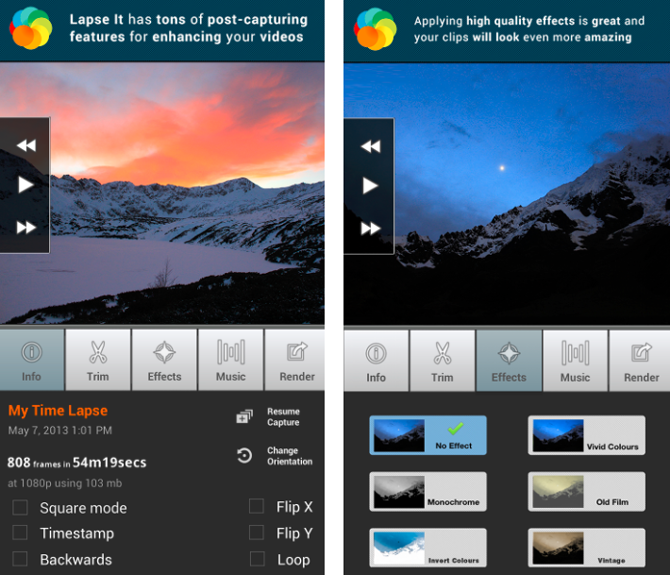 Verdict: Lapse It is one of the most feature-rich time-lapse video apps for the Android platform. While the free version does leave out some features like HD recording and ability to add music, as we saw in the previous app which was free, Lapse It is better if buy the pro version. 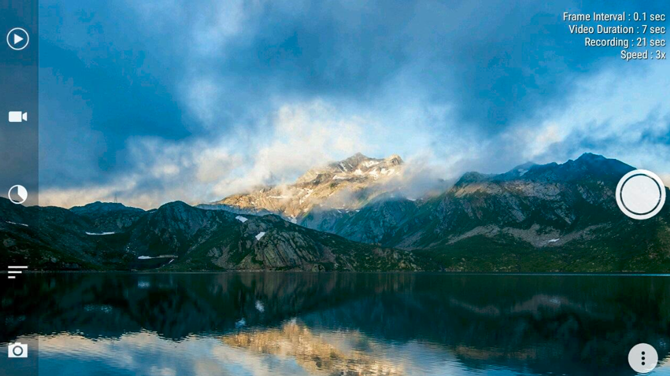 Hyperlapse is a simple little app from Microsoft. It is free to use and comes with no ads whatsoever. The moment you launch the app, you will be asked to begin recording your first time-lapse video. The app is bug-free and works great but offers a limited number of features. You can adjust speed, choose between different resolutions and stabilize the audio at 1x while the video is recorded in time lapse. Unfortunately, there is a watermark which I didn’t like at all. There is no way to remove it either. The app is popular among users because of its simple UI and direct approach. I wish it had more features for advanced users. Verdict: Hyperlapse is a cool little app that will get you started with your time-lapse video on your Android in no time. The app could use more features though. 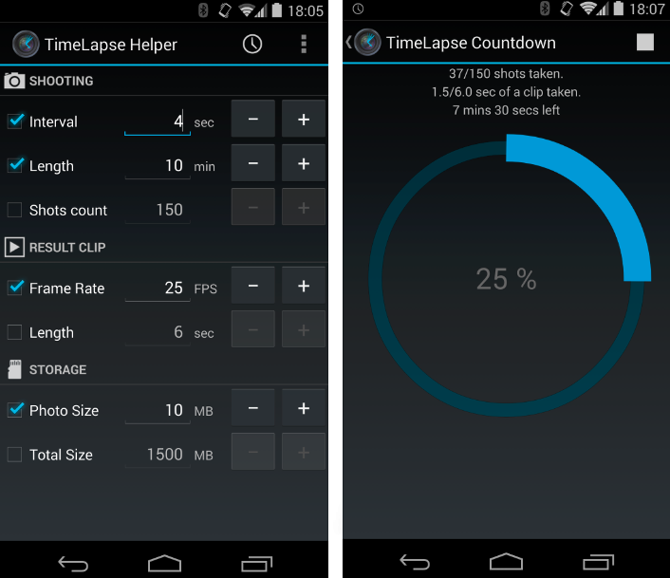 Framelapse is another time-lapse video maker for Android that is comparable in features and price to Lapse It above. There are features like frame interval, a timer to begin and end recording, zoom, and focus, exposure and color effects, set orientation and video resolution. It supports only MP4 video format but supports both front and back facing the camera. The pro version will remove ads, allow you to set custom video duration and frame interval, and lock exposure. One thing that I liked is that Framelapse will allow you to record with your screen off (sleep mode) which no other app allows. I wish there was 4K support and ISO support for people who use DSLR. Still, no app that does it so far. It also lacks manual focus. Verdict: Framelapse is a nice app that takes things further by adding sleep mode which works beautifully. It really helps save battery life. Installing this app on your phone before an actual Time-lapse app because it can calculate parameters of a time lapse. Now, this app comes in handy for both amateurs and professional photographers as it has a detailed set of parameters like Shooting interval, Shooting length, Shots count, Result Clip Frame Rate, Result Clip Length, Photo Size, and Total Size. You can simply upload your requirements and the app would calculate how many frames would be required to shoot the clip, how much time, and how much space would it consume. Verdict: This is a must-have app for all the people who want to optimize their Time-lapse shoot. It calculates crucial information which you would have to otherwise guess. If you are looking for a free time-lapse app for your Android smartphone, I suggest Time Lapse Camera because it is free and comes with more features than Hyperlapse. If you have the money and want to go professional, Lapse It and Framelapse are both good. The former has more features but the latter offers sleep mode. Depends on the situation you will be shooting in.